Curtis Ogden blogged about Thinking like a network 2.0, providing a summary of his understanding “of what is new and different when we call something a network, as opposed to a coalition, collaborative or alliance”. That was in October 2017. I loved the post and printed it. I wanted to do something that went beyond liking. Not every collaborative form maximizes network effects, including small world reach, rapid dissemination, adaptability, resilience and system change. And now, I add my own observations. I recently had the opportunity to observe a dynamic and thriving learning network in action. The network gathered for its face-to-face meeting assembling around 80 members from Eastern and Western Europe, South Asia, Africa and Latin America. 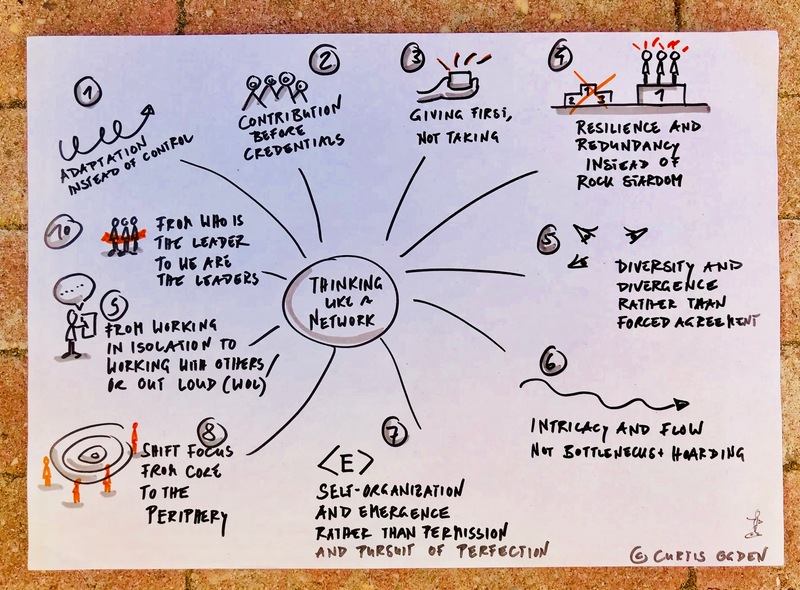 Retrospectively, I can say that the 4-days learning event was grounded in the network principles Curtis Ogden blogged about. The network’s focal point pulled together an organizing team of around 12 people. In addition she involved Hynek Bures for reporting and me as process facilitator for steering the preparation process and the overall facilitation. There was a lot of openness in the programming. The team reached out to network members for suggestions and contributions. Many phone calls were made, many emails exchanged. We involved the network members in shaping the program and defining the sessions. This collaborative approach created momentum for learning and laid the basis – our common ground – for how to work and learn together as a network. We designed a conversational event with plenty of opportunities for exchange and ample room for all voices to be expressed and heard. The network members made use of the space, they shared openly. It was a pleasure to see how network members contributed to the collective wisdom. I saw many stars, the network as a whole was shining. I saw a smiling network. The network celebrated the 10th anniversary (yes, we had a cake and we also had a party). 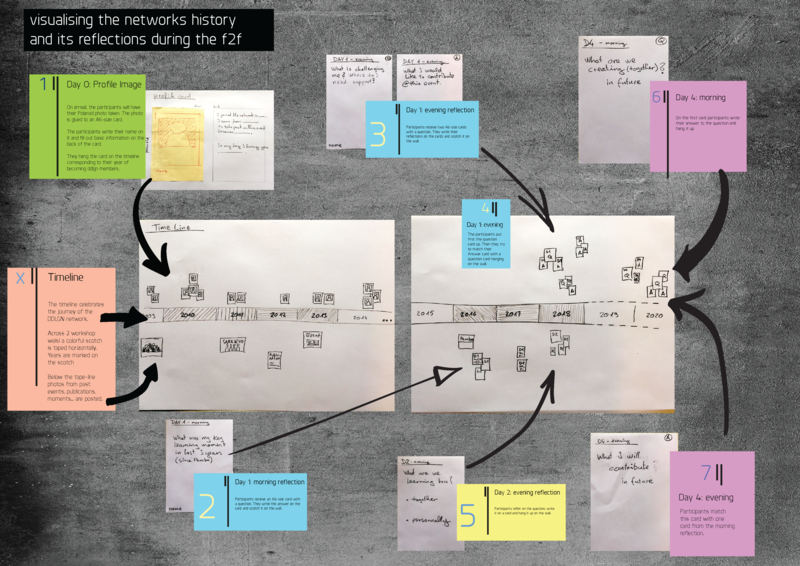 To honor the network’s work, we chose to build a timeline that covered the 10 years journey and to retell the network’s amazing story of learning and working together. We built the timeline with photos of key moments, portraits of the network members and colorful washi tape. During the four days together, we added reflection cards to the timeline. These cards provided another opportunity to reflect the network’s and the members’ learning. I saw a lively and distributed network. A well weaved network, strong and resilient connecting old members with new members, staff from field offices with headquarters with implementing partners with researchers. Members talked about ‘we’ and ‘us – the network’. The network is steered and animated by the focal point and a core team. There are regional hubs, learning journeys, seminars, learning retreats and trainings. I wondered – at least for the duration of the 4 days being together – where the core was and where the periphery. It needs a network mindset and an inclusive invitation process to organize a network event that involves and engages everyone. I saw the 12 members of the organizing team sharing the responsibilities for leading, facilitating and reporting. For me, as overall facilitator, this was an amazing experience, and I am grateful I could join this event.